Outdoor wood structures are exposed to constant weather-related challenges.The sun's UV-rays cause graying and bleaching. Excessive moisture from the rain and snow can cause mold and mildew, which leads to decay, distorting and cupping. The wood itself may start rotting due to changing weather climates. Or the wood can also be damaged due to existing animals or insects, like termites. Let us bring your wood back to life! 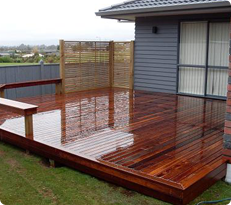 We possess the proper knowledge, expertise and training to restore your worn out deck, fence or porch to its true original beauty!